Please email me to suggest new ways to play! There are many fun ways to play Perplexus. It is equally at home as both a thoughtful single player game and as a multi-player competitive game. On this page I would like to define the cool approaches people have discovered on their own, along with some “official” and “competition” guidelines. There are the obvious single-player methods, like simply learning how to play, or going from 1 to 100 without falling off. But there are many other kinds of gameplay as well! Note: Regarding officially sanctioned timed competitions, standardized controls and methods will need to be defined in order to guarantee accuracy in all regions. 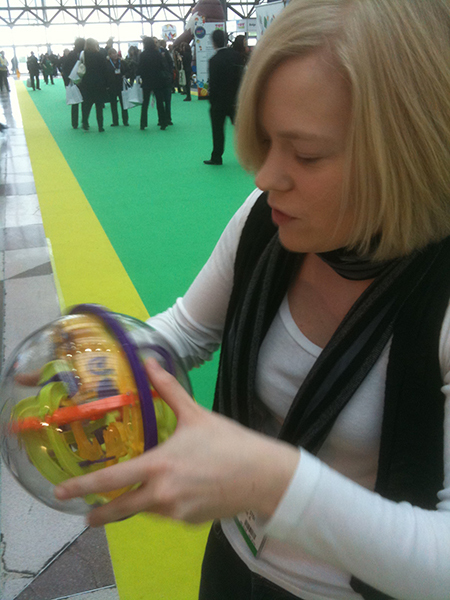 A first-time player at the Javits Center, February 2010. Basic Challenge gameplay is the most fundamental and non-competitive. Everyone starts out here. Many are satisfied with this level of play, and never try to reach for the stars. Its essence is to simply learn to navigate spatially and tactilely through the Perplexus. How do you get on the START position? What is a PLANE-CHANGE? Where do I go from here? This includes the “Ah Ha!” moment when the player first discovers the true 3D experience of Perplexus. Also included in this style of gameplay is exclaiming how much you hate the thing! (before you pick it up again and start over). The Basic Challenge is a journey of self-discovery, patience, perception, and focus. Many beginning players cannot stop themselves from telling others about Perplexus. You’ve developed an understanding of the game, but are still intimidated by move #30. So you practice this first section over and over, getting better and better. You practice many dozens of times, often to the detriment of others around you that want a turn. Your desire is to play accurately and fast. A benefit of this level of play is the development of muscle and auditory memory. Players that are good at getting from 1-26 can tell where along the path others playing the game are just by the sound of the ball bearing moving through Perplexus. So you’re ready to tackle #30, and maybe even visit YouTube to see if there are any tips on how to get past this point, and you find this. You are intimidated by the purple Tight Rope, until you actually cross it. The Pivot thrills, and the Upside-Down Drop (#41) seems impossible at first. The Ringed Turnaround at 43 requires subtlety, especially upon completion. You start to realize that numbers are not necessary to know where to go, and start naming the parts. Getting through the Zig-Zags with efficiency is difficult, and riding on the serpentine “Praying Man” means you are nearly through Practice Level One. You feel good, until you drop through the Tube at 58, and fall off. OK, you’ve developed some skills and feel accomplished. There is only one more practice level to get through. But unlike the first two, PL3 has 41 challenges (PL1 has 26, and PL2 has 34). You start out with one of the more delicate moves on the purple Railed Turnaround at 62, looking forward to the wonderfully satisfying double-sided Spiral and integrated Drop Cup just ahead. The Windup Key at 76 requires precision movement, but the second Backwards Drop is a piece of cake at 80. So much, that sometimes you get overconfident and fall off here. It seems to take a long time to get through Practice Level Three, and after traversing the second half of the Praying man, you are within striking distance of 100. Too bad the drop at 98 is so difficult, especially with such little practice. Falling off here is bittersweet, and “Send In The Clowns” is softly playing in the background of your mind. Eventually you make it, feeling near the end of your Perplexus journey because you reach 100 for the first time. In truth, you are merely a qualified novice. Some people go for it big time. 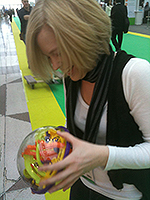 Occasionally there is a person who picks up Perplexus, and on the very first try makes it all the way to 100. Some of those people are simply brilliant, but others are very, very lucky. Still others thought they made it all the way through legitimately, but in reality accidentally jumped ahead through unintended cheats. Personally, you earned your place in “Going All The Way”, with weeks of true skill-building. You exclaim to others on blogs, etc, that going from 1 to 100 is doable. In fact, you do it 5 or 6 times. Now you are ready for head-to-head competition. Going Head-To-Head is really fun! Listed below are several variations on the theme. In this gameplay, two or more players start off at the same point simultaneously. The goal can be met in two unique ways: Casual and Hard-Core. The beginner’s round. Fun, fast, and friendly. This play variation can take a while in Casual mode. This game is toughest when played in Casual mode, simply because it may take dozens of minutes to complete. The Hard-Core version is quicker and not as relentless since the winner may not actually need to reach 100. CASUAL: Simply get to the goal first, regardless of how many times you fall off and restart. This version allows restarts, and is a satisfying method of play because even a novice can beat a seasoned player. Slow and steady may win this race, but an accurate and speedy player can still take chances, spicing up the competition. Oh, and did I mention that it’s really fun? HARD-CORE: Restarts are not allowed. If you fall off, by default the player still on the track wins! Everyone playing must be quite careful. But remember, a seasoned player can tell where another player is just by the sound of the ball, tensing up the competition a bit. Are you an armchair Free Runner or a wannabe Parkour athlete? Well, let Perplexus demonstrate your skills while sitting in an airplane, or while quietly taking a taxi. Can you jump the ball from the start position directly into the turnaround at number 6? If so, you are in the running to be a Freestyle player! This type of gameplay has no specific rules, per se. However, in a competitive fashion, points can be awarded for more skillful moves as defined by the players themselves or by judges. This can be likened to the point system used for gymnastics or ice skating in the olympics. A great Freestyler may be able to do some pretty fancy moves, perhaps only seen by other skilled players or in slow-motion instant video replay. Help develop Freeplay moves by uploading your videos to YouTube, and sharing them with me. I’ll add them to a playlist on my page here.